Transportation in Montana comprises many different forms of travel. Montana shares a long border with Canada, hence international crossings are prevalent in the northern section of the state; there are 13 road crossings and one rail crossing. As the fourth-largest state in the United States, journeying from one side to the other takes a long time. The state has an extensive network of roads, including state highways, Interstate highways and U.S. routes. Rail connections are also well-established and were an important method of transportation in Montana since the 1880s. Within individual cities, public transportation includes rapid transit and high-frequency bus services. For travel further afield, 16 airports are operational within Montana. Bozeman Yellowstone International Airport in Gallatin County is the busiest airport and there are another seven major airports and eight minor ones providing commercial services. Montana has approximately 70,000 miles (112,654 km) of highways which start in, pass through or are entirely inside the state. 1,198.8 miles (1929.2 km) of the Interstate Highway System, which serve as a thoroughfare for long-distance road journeys, is contained within Montana, and all of these are maintained by the Montana Department of Transportation (MDT). Speed limits are generally 80 mph (129 km/h) in rural areas and 65 mph (105 km/h) in urban areas. 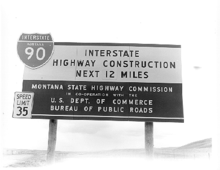 Two former national routes also ran through Montana before they were replaced by Interstates: US 10 and US 91. Mountain Line buses queue to pick up passengers in Missoula. In addition to these primary routes, Montana has a large number of state highways and smaller secondary routes. Speed limits on these roads are generally posted up to 70 mph (113 km/h) along rural areas. Vehicles themselves in Montana are required to display a Montana licence plate on the back and front by the Department of Motor Vehicles. Eight different primary plate designs have been issued since drivers were required to register their cars in 1913. The public transportation system in Montana is sparse as a whole, but several individual cities have local bus networks. Across Montana, the bus network does not have a large amount of intercity routes but Greyhound Lines goes to 20 cities including Helena, Sidney and Bozeman, connecting passengers with journey frequencies of between once to five times per day. Some individual cities have their own bus network provided by a transit corporation. Missoula is served by ASUM Transportation and Mountain Line; The Mountain Line public transit system runs twelve services around the city and the University of Montana. It is indirectly controlled by the local government which have appointed members onto the board of the transportation district. Billings is served by MET Transit and Great Falls by Great Falls Transit. All four agencies run routes with fairly frequent schedules allowing commuters quick movement around different areas of the cities. Historically, the state was traversed by the main lines of east to west transcontinental routes: the Milwaukee Road, the Great Northern and the Northern Pacific. All passenger rail in Montana is provided by Amtrak. Twelve stations exist within the state. All along the line Empire Builder, they serve communities along the most northern section of Montana which carries on out either side into Idaho and North Dakota. In terms of freight transportation, the BNSF Railway is the largest freight railroad with 1,983 miles (3,191 km) of track in Montana. The Class II Montana Rail Link operates 817 miles (1,315 km) of track leased from BNSF within the state. A number of other small railroad companies also exist. Hans Larson, Dayton, 1934 – ? An Airbus A319 waits at Billings Logan International Airport. Commercial air travel is common in Montana and there are up to 71 public and private airports in the state. The largest is Bozeman Yellowstone International Airport, located eight miles northwest of Bozeman, an hour and forty minutes away by road from Helena. The next largest is Billings Logan International Airport, near Billings, which has three runways and had over 388,000 enplanements in 2010. 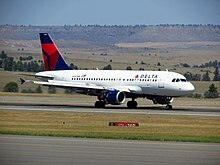 The busiest domestic destinations from Montana are Denver, Colorado, Minneapolis, Minnesota and Salt Lake City, Utah, and the main airlines are Delta Air Lines and United Express. ^ "States in order by size". State Symbols USA. Retrieved 17 August 2013. ^ "Governor's Office of Economic Development | Infrastructure | Transportation". Montana.gov. Archived from the original on 1 April 2013. Retrieved 10 October 2013. ^ "Route Log- Interstate Routes in Each of the 50 States". Federal Highway Administration. Retrieved 17 August 2013. ^ "Montana Highways Index". Retrieved 17 August 2013. ^ "Which states require a front license plate?". CarsDirect. Retrieved 24 August 2013. ^ "License Plate History". Montana Department of Justice. Retrieved 24 August 2013. ^ "Locations : States : Montana". Greyhound.com. Retrieved 17 August 2013. ^ "ASUM Transportation" (PDF). National Transit Database. Archived from the original (PDF) on 11 November 2015. Retrieved 21 August 2013. ^ "ASUM – Office of Transportation – The University of Montana". Life.umt.edu. Archived from the original on 27 June 2016. Retrieved 17 August 2013. ^ "Missoula Urban Transportation District (Mountain Line)" (PDF). National Transit Database. Archived from the original (PDF) on 4 March 2016. Retrieved 21 August 2013. ^ "Billings Metropolitan Transit" (PDF). National Transit Database. Archived from the original (PDF) on 3 March 2016. Retrieved 21 August 2013. ^ "City of Billings, MT – Official Website". MET Transit. 1 August 2013. Retrieved 17 August 2013. ^ "Great Falls Transit District (GFTD)" (PDF). National Transit Database. Archived from the original (PDF) on 3 March 2016. Retrieved 21 August 2013. ^ "Great Falls Transit District". Retrieved 21 August 2013. ^ a b "List of railroads of Montana". Railroads of Montana. Retrieved 17 August 2013. ^ "Feasibility Report on Proposed Amtrak Services in Southern Montana" (PDF). Montana Dept. of Transportation. p. 23. Retrieved 17 August 2013. ^ "Montana Rail System Map" (PDF). Montana Department of Transportation. Retrieved August 27, 2013. ^ "Distance between Bozeman, MT and Helena, MT". Retrieved 21 August 2013. This page was last edited on 1 December 2018, at 07:01 (UTC).